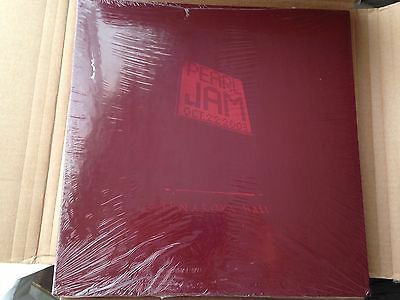 The record you're bidding on is an original limited edition 4 LP release of Pearl Jam's 2003 performance at Benaroya Hall. I have had this since it was released and have held onto it for the last 11 years. I have never opened it but when I received it the cellophane was shrink wrapped very loosely, it has never been opened but there is a small tear in the cellophane right over the hand written writing that shows it is number 781 in the pressing of only 2000 of it's kind. I am not very happy to let this go and hope it finds a happy home. If you have any questions please feel free to message me, what I'm asking for is what I'm willing to part with it for. Priority shipping will be included but if you would like insurance on this item I will have to add that to the final sale price of this item. Payment will only be accepted through PayPal and must be received before item will be shipped.